下午登錄 Bloglines 發現官網公告 Bloglines 可以繼續營運下去了! 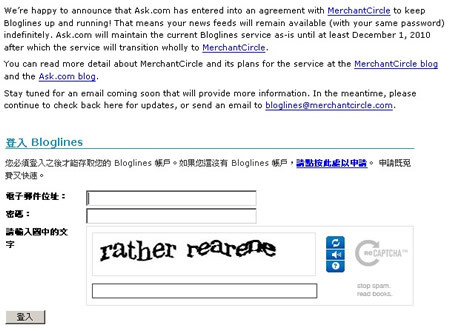 Bloglines的Ask.com會維護到2010年11月1日，過了11月1號之後就會轉給一家 MerchantCircle 繼續接手營運! 這真是太好了! 可以不用轉換用Google Reader了!